You are cordially invited to attend the Change of Command Ceremony for Marine Safety Unit Chicago. On June 28, 2019, Commander Zeita Merchant will be relieved by Commander Randy Preston. Please click on the below link for more information. You may RSVP by using the following link by May 30, 2019. 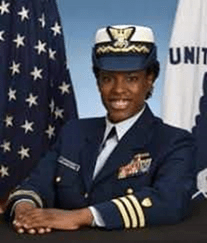 CAPT(sel) Lexia Littlejohn will become the first African American Woman Coast Guard ‘Captain of the Port’ and Commanding Officer (CO) of a Sector when she assumes the duties and responsibilities of Sector Buffalo CO on June 28th. Change of Command Information below. A reception will immediately follow the ceremonies. Marine Corps Col. Melvin G. Carter has been nominated for appointment to the rank of Brigadier General. 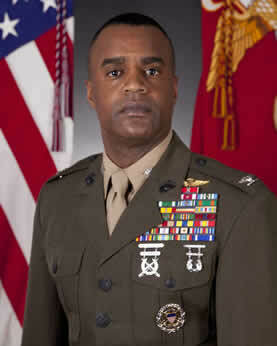 Marine Corps Col. Melvin G. Carter has been nominated for appointment to the rank of Brigadier General. Carter is currently serving as the director J-2, Joint Task Force, Marine Corps Augmentation and Training Support Unit, Fort Bragg, North Carolina. Old Dominion University has named Elaine Pearson associate vice president for academic affairs, effective June 25. Pearson is executive director for academic and student affairs at the University of Houston-Downtown, where she is responsible for the division’s annual budget, administrative procedures and compliance. She also serves as an adjunct faculty member. Noting Old Dominion’s “military-friendly campus community,” Agho also highlighted Pearson’s service record. Pearson earned her bachelor’s degree in information systems from the University of Houston. She also holds a master’s degree in educational technology and an M.B.A.
She is a board member of Texas Women in Higher Education and a life member of the National Naval Officers Association. Pearson will replace Jim Duffy, whom Agho thanked for his “many years of effective management and leadership in this position” and his “exceptional years of service” to the University. Duffy will retire in July but will work closely with Pearson during her transition into the new fiscal year. 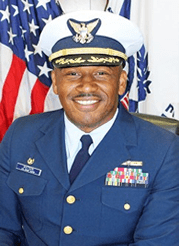 NNOA is very pleased to announce that our Immediate Past President, CDR Will Watson has been selected for promotion to USCG Captain.